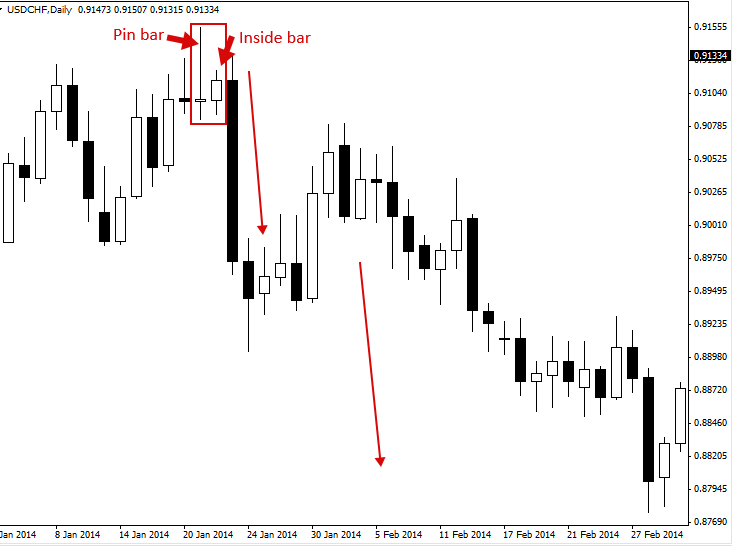 A pin bar pattern consists of one price bar, typically a candlestick price bar, which represents a sharp reversal and rejection of price. The pin bar reversal as it is sometimes called, is defined by a long tail, the tail is also referred to as a “shadow” or “wick”. The area between the open and close of the pin bar is called its “real body”, and pin bars generally have small real bodies in comparison to their long tails. The tail of the pin bar shows the area of price that was rejected, and the implication is that price will continue to move opposite to the direction the tail points. Thus, a bearish pin bar signal is one that has a long upper tail, showing rejection of higher prices with the implication that price will fall in the near-term. 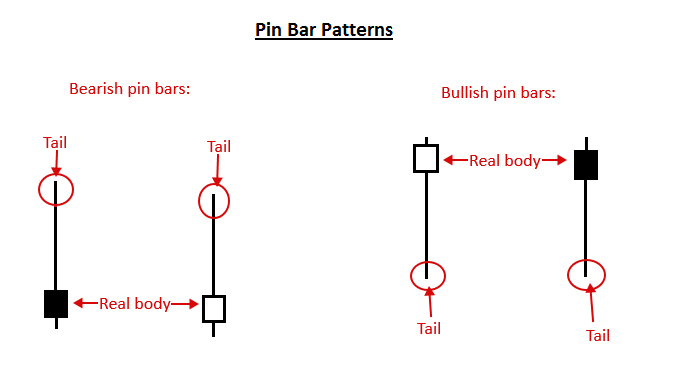 A bullish pin bar signal has a long lower tail, showing rejection of lower prices with the implication that price will rise in the near-term. When trading pin bars, there are a few different entry options for traders. The first, and perhaps most popular, is entering the pin bar trade “at market”. That simply means you enter the trade at the current market price. 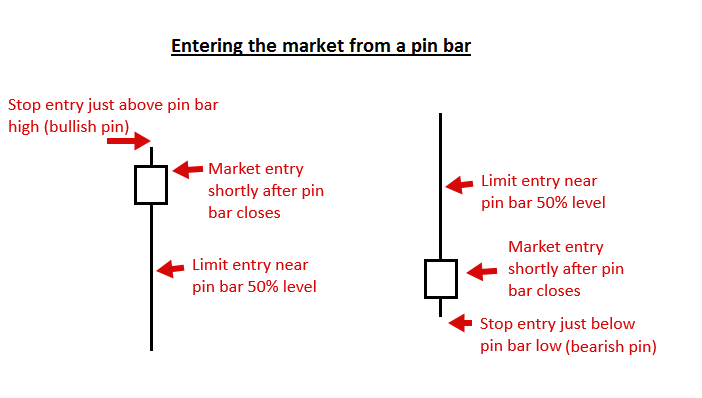 Note: the pin bar pattern must be closed out before entering the market based on it. Until the bar is closed as a pin bar pattern, it’s not really a pin bar yet. Another entry option for a pin bar trading signal, is entering on a 50% retrace of the pin bar. In other words, you would wait for price to retrace to about the halfway point of the entire pin bar’s range from high to low, or its “50% level”, where you would have already placed a limit entry order. 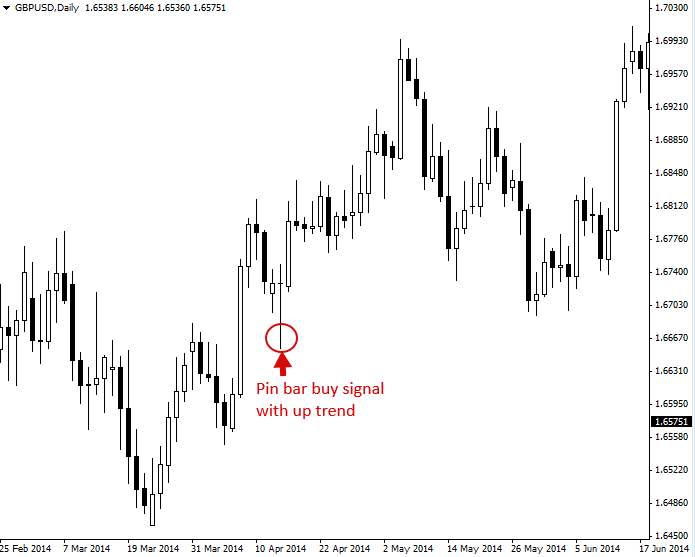 A trader can also enter a pin bar signal by using an “on-stop” entry, placed just below the low or above the high of the pin bar. Trading with the trend is arguably the best way to trade any market. 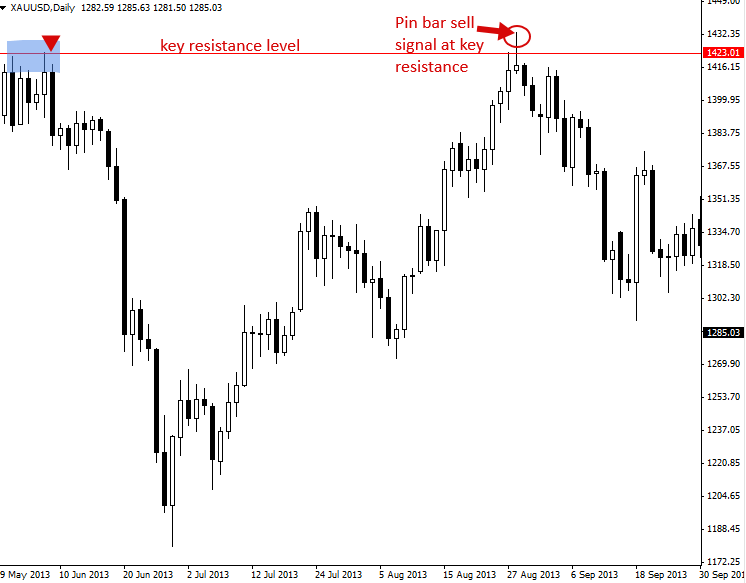 A pin bar entry signal, in a trending market, can offer a very high-probability entry and a good risk to reward scenario. 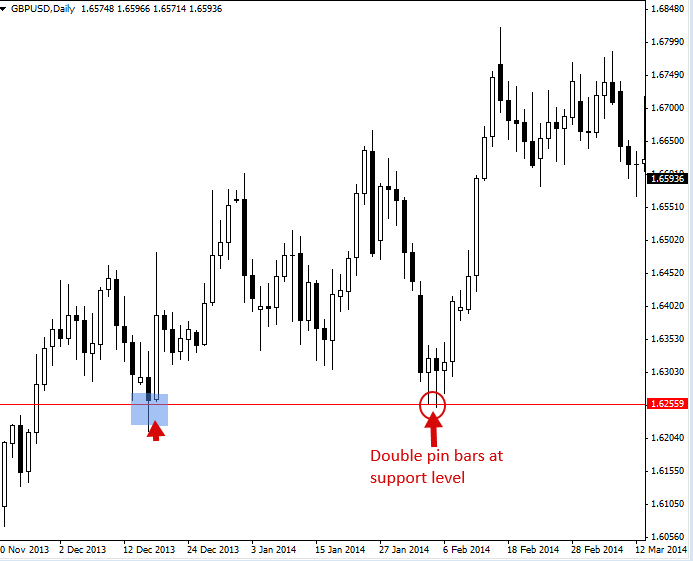 When trading a pin bar counter to, or against a dominant trend, it’s widely accepted that a trader should do so from a key chart level of support or resistance. The key level adds extra ‘weight’ to the pin bar pattern, just as it does with counter-trend inside bar patterns. Any time you see a point in the market where price initiated a significant move either up or down, that is a key level to watch for pin bar reversals. As a beginning trader, it’s easiest to learn how to trade pin bars in-line with the dominant daily chart trend, or ‘in-line with the trend’. Counter-trend pin bars are a bit trickier and take more time and experience to become proficient at. Pin bars basically show a reversal in the market, so they are a very good tool for predicting the near-term, and sometimes long-term, direction of price. They often mark major tops or bottoms (turning points) in a market. Not every pin bar is going to be one worth trading. The best ones occur in strong trends after a retrace to support or resistance within the trend, or from a key chart level of support or resistance. 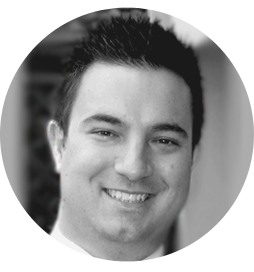 As a beginner, keep your eyes peeled for daily chart time frame pin bars as well as 4 hour chart time frame pin bars, as they seem to be the most accurate and profitable. Longer tails on a pin bar indicate a more significant reversal and rejection of price. Thus, long-tailed pin bars tend to be a little higher-probability than their shorter-tailed counter-parts. Long-tailed pin bars also tend to see price retrace to near the pin bar’s 50% level more often than shorter-tailed pins, this means they are typically better candidates for the 50% retrace entry discussed previously. Pin bars will show up in any market. Be sure you practice identifying and trading them on a demo account before trading them with real money. Practice makes perfect. I hope you’ve enjoyed this pin bar pattern tutorial. 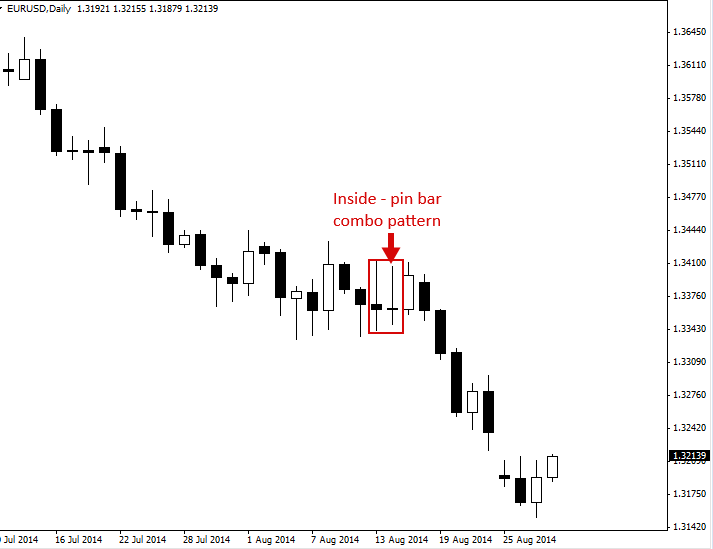 For more information on trading pin bars and other price action patterns, click here.